The product package shall consist of: One 4K Ultra HD STB, One Smart Card (inserted in the STB), One Remote, One Coin Battery, One HDMI Cable, One Power Adaptor, One User Guide Book / Manual of Practice ("Product"). Individual items are not for retail sale. 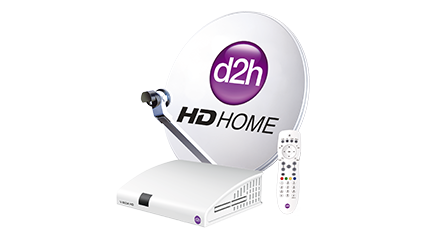 Specially packed for the purpose of servicing DTH Industry. The Offer Price (Rs. 6590/- is applicable for new Subscriber and Rs. 5990/- is applicable for the existing Subscriber) is inclusive of cost of the Product, standard installation/ activation charges and applicable taxes, if any. The New Subscriber shall be bound to pay Rs. 375/- at the time of activation to our authorised engineer. The aforesaid Offer Price for the New Subscriber includes the amount of Rs. 375/- to be paid by the Subscriber at the time of installation. Standard Cable Length is 10 meters, any cable usage beyond 10 metres will be charged @ Rs.12 per meter by the authorized engineer, which need to be paid by Subscriber, at the time of installation, on actual length of the cable. 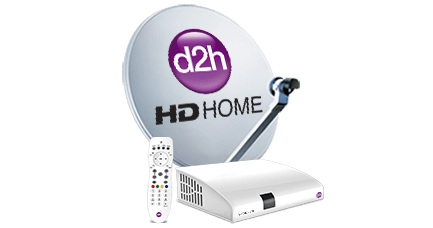 The Subscriber can pre-book the Product either through our website www.d2h.com or by calling our Customer Care helpline number 91156 91156. Warranty is applicable only on 4K Ultra HD Set Top Box for a period of One (1) year from date of installation. Under no circumstances whatsoever, the Subscriber shall be entitled to claim refund for the amount paid for the Product. Product will be provided on rental basis only. Product will be delivered within four (4) working days from the date of booking / realization of payment whichever is later. 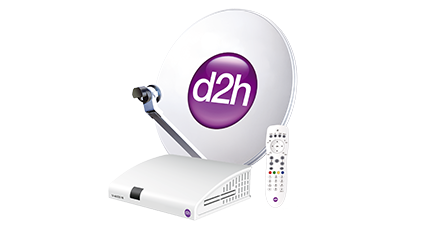 Notwithstanding anything contained elsewhere in this Terms and Conditions, d2h is not liable for any delay in delivery of the Product. The Existing Subscribers opting for up-gradation their existing CPE with the Product need to simultaneously return the existing CPE, its Smart Card & remote control. 4K channel(s) will be provided by us on event basis, as & when the 4K feed is provided by the broadcasters, which will be charged in addition to the package subscription. For New Subscribers, subscription to Platinum HD/ New South Platinum HD pack is mandatory for activation of the 4K Ultra HD STB. In addition to 4K channel(s)/ content, Subscribers can continue to use the Product to view the Standard Definition and High Definition channels. The terms and condition are subject to change without prior intimation. In the event of any and all disputes or controversies arising out of or in connection with the interpretation of the provisions of these terms and conditions, the decision of Dish TV India Limited shall be final and binding on the Subscribers. By availing for this Product, it shall be construed that the Subscriber has read, understood, accepted and agreed to abide with all the terms and condition stated hereunder.